Over the years we have found our 5 day shark trip to be an incredibly popular package, especially among photographers and Great White enthusiasts, and for those guests who don’t have the opportunity for a full 10 days. Spend 5 days focusing on observing the unique Great White Shark “AIRJAWS” breaching and natural hunting behaviour on cape fur seals. Predation is one of the most fundamental interactions in nature and one of the most inherently fascinating. But predation is rarely observed in the wild. Seal Island, in False Bay, South Africa, provides unique opportunities to observe natural predation by White Sharks on Cape Fur Seals and to observe social interactions among both species. 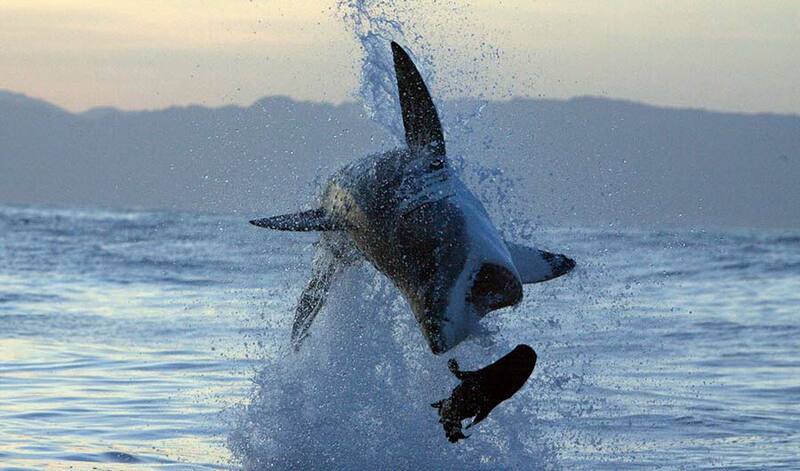 Shark Breaching is a spectacle to behold! Join us for a 5 day shark breaching and natural hunting experience! 06h30 Sharp on the Simons Town Pier. From designated pick-up points in and around Cape Town – special transfers can also be arranged. 5 x Premier Airjaws Trips. Luxury 4 star accommodation in Simon’s Town. Should you prefer we can also arrange your stay in a guest house or hotel in Simon’s Town. Transport to and from the airport. Transport from accommodation to pier (optional transfer back to accommodation at extra cost). All dive gear on the boat. Light snacks and refreshments on the boat. As we return every day at lunch time, you will have your afternoons free to yourself. Feel free to explore Cape Town’s many world famous landmarks, such as Table Mountain, Cape Point, Boulders Penguin Colony, as well as the Constantia Valley wine farms. There is also an excellent golf course 5 minutes away. Township tours and bicycling through the local township. Wine Tasting in Stellenbosch ( highly recommended). Accommodation is based on a bed and breakfast basis with self catering as an option. The venue is the beautiful luxury 4 star Mariners Guest House. Newly built (2009) above the harbour in Simon´s Town, Mariner Guesthouse offers 4 Star luxury accommodation at affordable rates. We pride ourselves on being eco-friendly and have become known for our style, comfort and friendly hospitality! The guesthouse is located in a quiet street on the mountain – within walking distance of local restaurants and beaches. Our 8 spacious and beautifully appointed en-suite bedrooms offer world-class facilities for B&B and self-catering. Book now for the best Shark Cage Diving experience EVER! Come Shark Cage Diving in Simonstown! Enquire now for the experience of a lifetime!